Founders of Blood Brother Nicholas Biela and James Waller are pioneering a cutting edge approach to creating menswear, footwear and accessory collections. The duo makes sartorial sportswear apparel, defining themselves as highly distinctive, due to their precision-led aesthetic. Combining contemporary design with incredible garment construction and the essentials of comfort and functionality, the duo are a promise for responsibly made, comfortable and smart menswear. 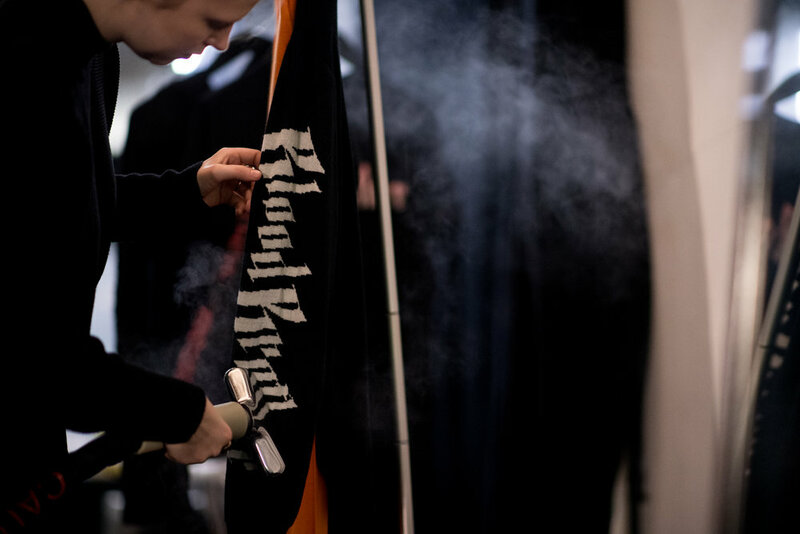 At LFWM, the duo transformed the British Fashion Council’s presentation space into a dark, hardened shell. The collection promised potency with styling by Danielle Emerson and set design by Thomas Bird. Models stood around a grey industrial box with strong brows, incredibly sturdy stances and fierce faces. 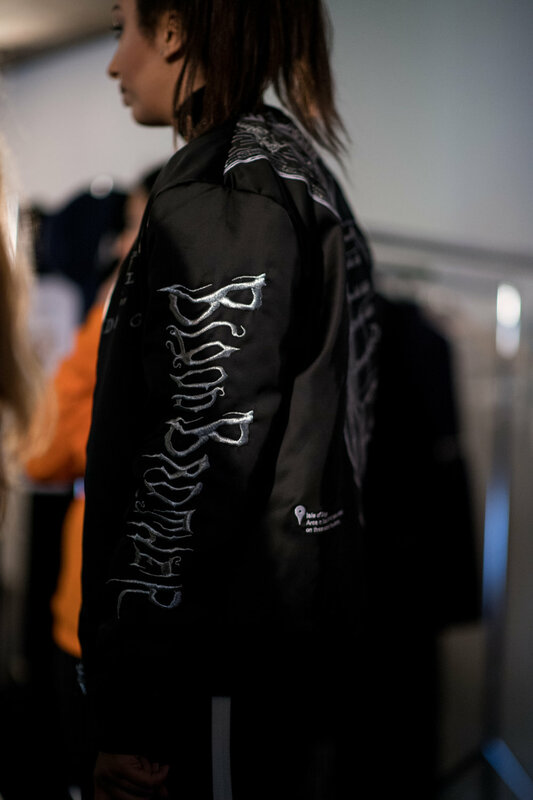 Coats were very much the centre point, three of which were zipped up to the neck of each model with incredible closing and security detailing. Colour came in the form of orange and navy, the rest of the clothes kept to black and grey. An orange jacket, which was held with a black zip and white collar, was reminiscent of a 1980s football casual jacket, smartened with black trousers. Roll necks and sports style sweaters extended the notion of working class eighties British culture, styled with scarves and hats to create a sophisticated take on a British casual look. Silk was seen in the form of a kimono style jacket and black and white printed trousers. When looking for the most unique piece in the collection, this has to be it, however, as a whole, the collection was dark, but vibrant, and had meaning beyond obvious references. 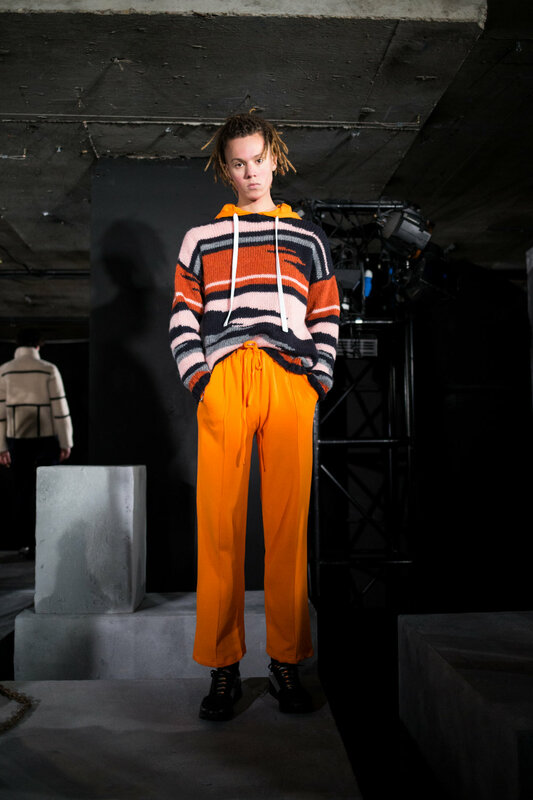 It’s a uniform for the men who want to combine sportswear with a sophisticated element of tailoring and feel really together – both in their look, and in a collective.